It's all part of the new "Nintendo Account" system, which unifies the somewhat haphazard collection of logins that Nintendo had before. You can create a new Nintendo account (even if you don't own any new Nintendo hardware) on its own or link it with Facebook, Google+, or Twitter. Naturally you can also import data from your older Nintendo Network ID, which presumably will be used to bring in any Mii characters that have already been created on the Wii U or 3DS game systems. 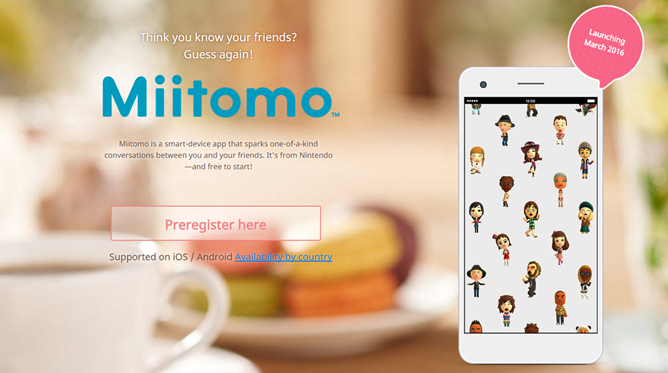 Miitomo is a mobile version of the Mii setup that already allows the Mii characters to interact with other avatars in a semi-autonomous way. More conventional Nintendo games should be arriving on mobile starting later this year - Pokemon seems like a shoe-in, considering the recent 20th anniversary celebrations.